The three-year, £110 million UK Department for International Development (DFID)-funded Building Resilience and Adaptation to Climate Extremes and Disasters (BRACED) programme aims to build the resilience of up to 5 million vulnerable people against climate extremes and disasters. It was launched in January 2015 and supports over 120 organisations in 15 consortia across 13 countries in East Africa, the Sahel and Asia. Understanding the extent to which these projects are able to strengthen the resilience of the households, communities and organisations they work with is critical to ensuring that successful approaches are scaled and replicated. The overall purpose of this evaluation is to determine to what extent household-level resilience has increased as a result of BRACED interventions. 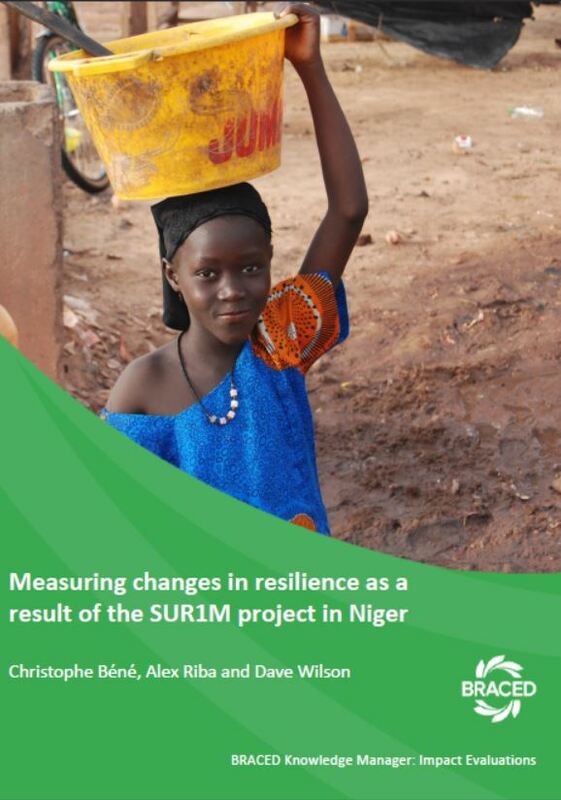 This report presents the results of the BRACED Impact Evaluation of the SUR1M project in Niger. The SUR1M (Scaling-Up Resilience to Climate Extremes for over 1 Million People in the Niger River Basin) project was implemented by Catholic Relief Services (CRS) from 2015 until the end of 2017 with a series of local and international partners. It aims to strengthen the resilience of the local population to climate extremes. It is one of the 15 resilience projects funded by the UK Department for International Development (DFID) under the three-year Building Resilience and Adaptation to Climate Extremes and Disasters (BRACED) programme in Africa and Asia.